Genus: Iris Tourn. ex L.
The genus Iris has around 250 species. Iris comes from the Greek word for rainbow, referring to the many colours of the flowers in this genus. Iris afghanica has been described as the finest plant introduction from Afghanistan, and the most superb of the regelia irises. Rear Admiral Paul Furse and his wife Polly made several expeditions to western and central Asia in search of plants during the 1960s. Furse was an accomplished botanical artist and amateur botanist who, after his retirement from the Navy, spent several years searching for bulbs. While in Afghanistan in 1964, they came across this beautiful iris growing on the northern side of the Salang Pass in the Hindu Kush, north of Kabul. They initially thought it was a form of Iris darwasica but after finding it again on their second expedition to the region in 1966, came to the conclusion that it must be a new species. 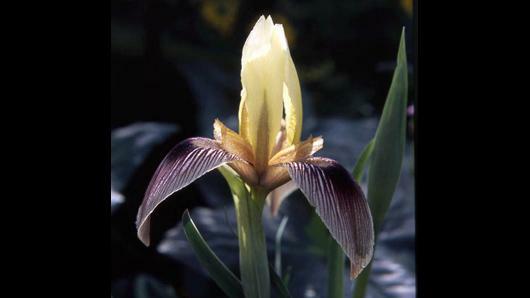 The species was eventually described in 1972 and given its name - Iris afghanica. Occurs only in north-east Afghanistan. Iris afghanica is a striking species. The slender, bluish-green leaves can be up to 30 cm long, though are often shorter, and the outer ones are sickle-shaped. All irises have six perianth (sepals and petals) segments making up the flower. Three arch downwards and are called 'falls', and three point upwards and are called 'standards'. The flowers of I. afghanica are about 8-9 cm across. The pointed creamy-white falls are heavily veined with purple-brown and have a solid purple patch in the centre. Each fall has a beard of yellowish or purple hairs at its centre. The pointed standards are pale yellow and have a beard of greenish hairs on the lower part. At higher altitudes the plants are more strongly coloured and only about 10 cm tall. At lower altitudes the flowers are larger and more softly coloured, and the plants can reach 25 or 30 cm tall. 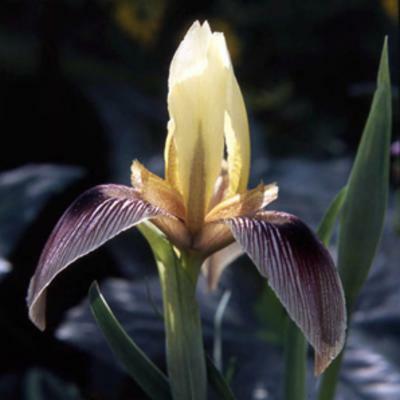 Although far from common, Iris afghanica is now established in cultivation. In its natural habitat, Iris afghanica experiences hot, dry summers and freezing winters so it is perfectly hardy but must be kept dry when dormant. For this reason it is best grown in a well-ventilated cold frame or alpine house, to protect the rhizomes from rain in the summer. Regelia irises often do better if given a free root-run by planting directly into a frame bed. Some species, such as I. hoogiana from the Pamir Alai in Central Asia and I. korolkowii from the Tien Shan and Pamir Alai mountains of Central Asia, can be grown outside in a well-drained, sunny border. Plants can be increased by dividing the rhizomes in late summer, as the plants are re-potted. Iris afghanica is rare in cultivation and it is even rarer to find two clones grown together, so seed is very seldom available. Different clones are needed because the plants are self-incompatible, so a flower cannot be fertilised by its own pollen. Iris afghanica can be seen in the Davies Alpine House at Kew when in flower. Spirit-preserved specimens of Iris afghanica are held in Kew's Herbarium, where they are made available to researchers, by appointment. The details of one of these specimens can be seen online in the Herbarium Catalogue. Among boulders and on steep rocky slopes at altitudes from 1,500 to 3,300 m.
Not Evaluated (NE) according to IUCN Red List criteria. Some species of Iris are poisonous if eaten. Wendelbo, P. & Mathew, B (1975). Flora Iranica 112: 1-79. Naturhistorisches Museums Wien. World Checklist of Selected Plant Families (2011). (accessed 26 April 2011). The Board of Trustees of the Royal Botanic Gardens, Kew. Beentje, H. (2010). The Kew Plant Glossary. Royal Botanic Gardens, Kew. Wilford, R. (2010). Alpines from Mountain to Garden. Royal Botanic Gardens, Kew. Manning, J. & Goldblatt, P. (2008). The Iris Family: Natural History & Classification. pp. 200–204 Timber Press, Portland, Oregon. Cooper, M.R., Johnson, A.W. & Dauncey, E.A. (2003). Poisonous Plants and Fungi: An Illustrated Guide. The Stationery Office, London.